Update: The sample for the 200 startups was collected in February 2013, and does not, therefore, include a few startups that have since been launched. I’ve added a fourth graph at end of the article showing some additional Angel investors who have supports startups not in the original sampling. 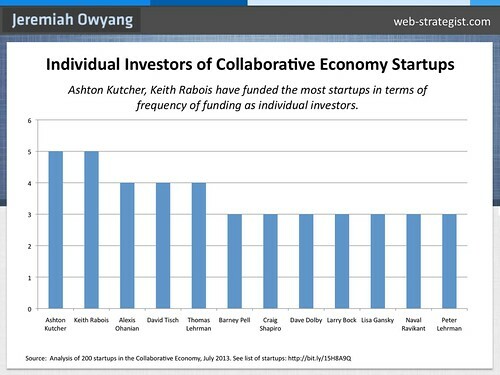 As part of my ongoing research as an Industry Analyst on the Collaborative Economy (read all the posts), I have talked about market drivers, the market challenges, corporations who have jumped in, provided a list of startups, and published a definitive report called The Collaborative Economy. I will now help you to better understand the funding aspect of this growing movement. We obtained a list of 200 startups (appropriately using a Taskrabbit, I might add) in order to get our initial sample. I recently published an infographic helping to reveal the patterns in this sample. Now I want to expose some additional data about the force that funds this space. Heavy Funding Has Spurred this Market Forward. Across the 200 startups, I have found that 37% had been funded, with startups receiving an average of $29 million in funding. The 200 had received over $2 billion in total funding, which is a very high amount for a largely undeveloped, pioneer market. Interviews with several of the Venture Capitalists in this space indicated that they favor two-sided marketplaces which scale and have low inventory costs. They are basically transaction machines akin to eBay or Netflix. 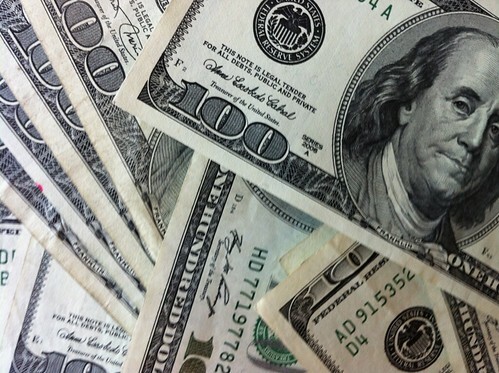 A Few Startups Received Exceptionally Large Funding Amounts. Not all startups are equal. Some have received far more funding than others. These giants include players like AirBnb which received about $120 million; Lyft, which recently raised around $60 million; and Uber, securing over $57 million. Most startups have not yet obtained such large funding amounts, although, as this market heats up, it will find additional funding opportunities. SV Angel and Benchmark Funded Most Frequently. 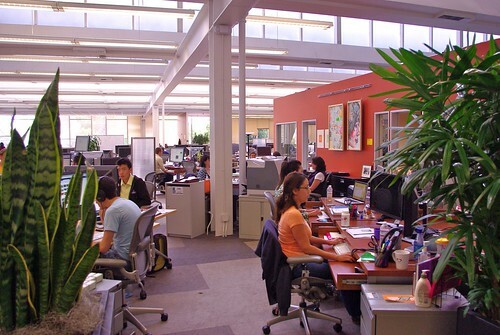 San Francisco and Silicon Valley-based firms funded these firms most frequently, which coincides with the high concentration of Collaborative Economy startups in the SOMA district of the city. In particular, SV Angel and Benchmark were the highest frequency funders, followed by Incubator/Accelerator 500 startups Andressen and Floodgate, which are located in the Silicon Valley and San Francisco area. Market Has Received Early Stage Funding. Of the total funding of the nearly 80 startups, most are in an early stage, with the most dominant being Seed round, followed by ‘A’ round. The other category includes non-disclosed personal loans, bootstrapped self loans, and the ambiguously termed ‘Venture Round,’ which could be construed to mean a variety of things. This early market funding, which started to emerge about 3 years ago, matches the funding levels being shown. Individual Investors Include Hollywood Stars and Internet Veterans. Early stage funding often includes celebrity investors who want to get in on the action, angel investors, and a “friends and family” round of other successful entrepreneurs. Ashton Kutcher has invested in 5 startups in this market, and seasoned internet exec, Keith Rabois, is reported to have individual investments in many startups in this market. We should assume there are other personal loans and investments made that were not apparent in our public searches. After segmenting the data, we comprised these graphs, based off frequency patterns per startup. Above: Individual investors are based off an updated sample size in Feb 2013, while data is accurate, it did not include new startups that were added to this market. Above, On July 14th, I’ve added the following graph, which includes new investors not in the original sample size, collected in Feb. In all cases these graphs are correct, but they represent different sample sizes. New investors include Mike Walsh and Shervin Pishevar, who take the lead, in terms of frequency. 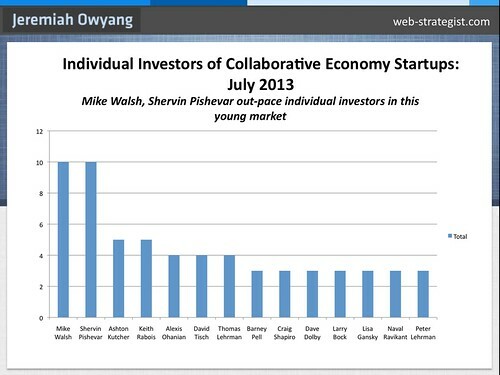 See the full data sample was from 200 startups in the Collaborative Economy. Read the infographic to obtain a summary. Special thanks to the Collaborative Consumption crew, as many of the names were obtained from their site. Of the 37% who’d been funded, we mined public records ranging from Crunchbase, startup website, investor website, Wikipedia, news sources, and press releases to obtain data. We don’t believe this list is complete, but it is a representative sample of funding from easily obtained public sources. We included the term “venture round” is an ambiguous term which can be used in a variety of ways, in the ‘other’ category, as it’s used both in early stage and later stage funding rounds. Obtaining the exact amount of how much each firm or individual invested is next to impossible, so obtaining frequency, and estimating per round helps to determine a relatively reliable figure. Compounding this complexity, multiple investors are often involved in each round, making specific dollar amounts even more difficult to determine. This information should not be used for official financial advice or guidance, but only for entertainment purposes only. If you liked this post, see all my coverage and data on the VC market. 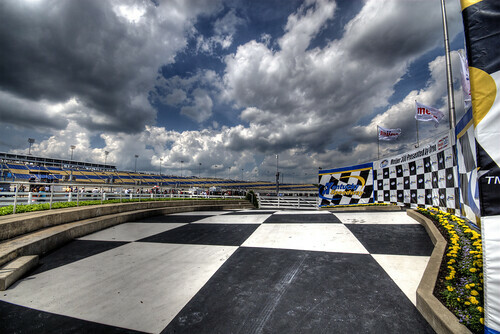 Photos used under Creative Commons, by Philip Taylor. 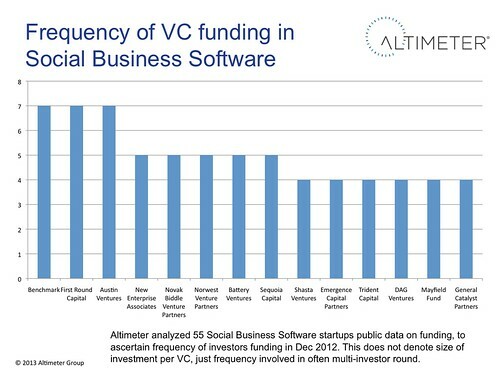 Which VC invested the most frequently in Silicon Valley Social Networks? Surprise! They’re from NY! This is part of my continue industry analysis of the changing digital space (see all posts tagged VC), but probing which investors are most active –and are bellwethers for finding future growth companies. Ever wonder who’s behind the backing of some of the fastest growing technology companies? To find out, I created tables and collected public data to list out the specific investors of each of the major social networks, and social media sites, and conducted frequency analysis of the investors to find out. This is part of my continued coverage of investors in the social business space, read the rest of my posts, analysis, and insights to this important group in our industry. One caveat, I’m not a financial analyst, I’m an industry analyst, and this data shouldn’t be considered for investment purposes. Financial investment data of these social networking companies seems like it’s easy to get, but it’s very unstructured. The data was all over the web, it was hard to find a single repository of information, common sources were press releases, wikipedia, CrunchBase, and corporate web pages. It’s difficult to tell the specific amount each VC put into a shared investment round, even probing through the S-1 filings would not yield the specifics of each investor. Early Stage Funding Modest. Research found there were over 120 distinct investors, which includes about 50 individual investors or angels. Among them, most investment rounds in A-X had multiple investors in each round. 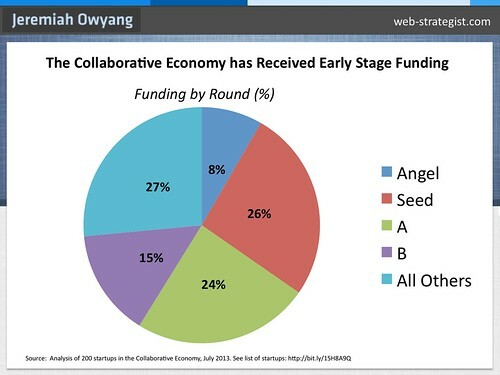 A handful of angel and seed rounds had individual investors. Seed round amount across the 17 startups was a mere $3m, yet the sum of the angel rounds grew to $863m, a big chunk of that amount is Reid Hoffmans multi million dollar investment into Zynga, which in some categories can be considered to be as large as some C or D rounds. Later Stage Funding Balloons. Across this category of 17 social networks, the largest rounds of funding were within C and D, each over 1 billion. A Rounds across these startups were a sum of $85m, followed by B Rounds of $620m, C Rounds of $1,2b, D Rounds $1,7b, then a tapering off as E of $452m F of $376m and G Rounds of $110m. As usual the later rounds had institutional investors, banks, and larger VC firms. The amorphous term “venture round” (a sum of $2.5b) in this space was often a late stage growth round, which, in my opinion, was used to bolster valuation before a startups material event. NY Union Square Ventures Leads the Way, Frequency Wise. 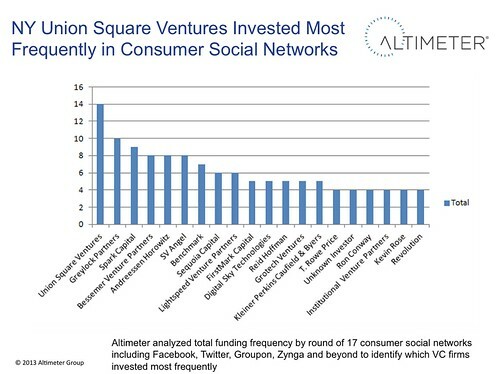 While this doesn’t account for total size of investments, we found that NY based Union Square Ventures invested in many deals, and had up to 14 investments in social networks over the past years. Like most rounds, they were involved in multi-investor deals, and frequently was involved in majority of A and B rounds. This investor, placed many investments a early A, then came back for B through C after they saw traction. Concluding Remarks: At first, it’s surprising that the most frequent investor of silicon valley social networks is NY based Union Square ventures, but if you look at the pattern, they placed early bets, saw growth, then double and triple downed their investments. While frequency doesn’t account for total fund performance, it demonstrates the specific strategy some VC firms are playing. On the other hand, Russian Based DST places few bets, but when does, places them big and strong, after seeing growth. Both investment strategies are needed for emerging markets, both for initial catalyzing, then followed by acceleration, then increased in valuation. 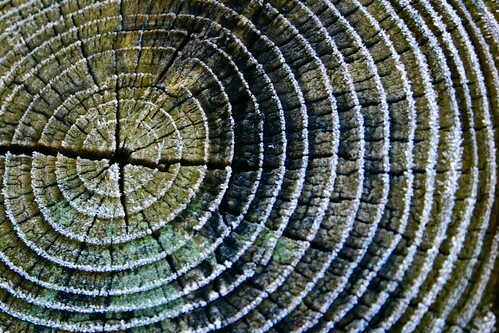 These patterns help to define the market maturity of a space, and you should use them to identify maturity stages in the markets in which you’re acting.